Tinuku - Interstellar Technology's second rocket failed seconds after taking off in Hokkaido on Saturday. The first Momo-2 rocket launch developed by the Japanese private sector to reach outer space has failed after being burned just seconds after taking off from a test site in Taiki, southern Hokkaido. Interstellar Technologies Inc. founded by former President of Livedoor Co. Takafumi Horie said Momo-2 exploded at around 5:30 am, right after launch at Taiki. 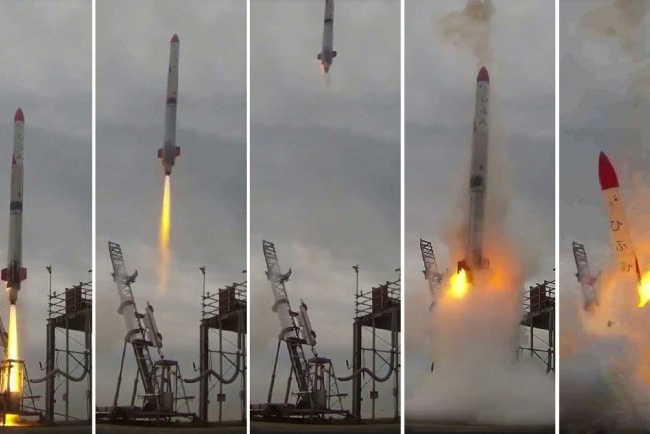 The unmanned 1-ton rocket, 10m long and 50cm diameter marks the second consecutive failure for the company. The Momo-1 rocket was launched to a height of more than 100 km but had to be canceled after losing 70 seconds of contacts into the flight. Originally planned to launch Momo-2 by the end of April but was postponed due to nitrogen leakage. Failure shows a difficult road ahead for private rockets. "I can not immediately understand what happened. The unprecedented failure we have to find ways to improve," said Interstellar Technologies President Takahiro Inagawa. Inagawa said Momo-2 lost thrust four seconds after takeoff and that the main engine may have problems where this launch cost tens of millions of yen. The company collected about 28.4 million yen ($ 257,000) through crowdfunding.